Fibre Glast can provide the supplies and tools you need to make your composite parts. Fiberglass supplies and carbon fiber supplies are generally the same tools. Our line of composite material supplies have been selected to work with fiberglass, carbon fiber and Kevlar® as well as polyester, epoxy and vinyl ester resins. 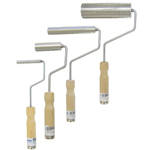 These tools will stand up to resins and acetone without dissolving. Click on an image below to browse the categories below and find all of the supplies and tools you need for your project. 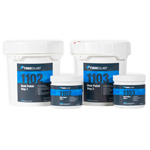 Spray gel coat, PVA, primers, and more. Fibre Glast professional-grade spray guns won't let resin set up in the gun. Choose from a selection of guns, accessories, and replacement parts to keep your spray guns working properly for many projects to come. Scissors, cutting tools, and fabric aids specially selected form composite work minimize prep time and wasted materials. From Kevlar® scissors to detail trimmers, this category is sure to have the tool that will keep your cuts clean, straight, and right on the mark. All items are in stock for same day shipment. With an abrasive tungsten carbide grit, Perma-Grit® tools are ideal for cutting and finishing fiberglass, carbon, and Kevlar® laminates. Perma-Grit tools deliver clean edges, smooth surfaces and are renowned for their usability with composite laminates. Check out other products from Dremel® and Bosch. Protect your composite with a quality, high-gloss finish. Our sanding and polishing category includes Wetordry™ sandpaper, Meguiar's Machine Glaze, mold polish, and more. You supply the elbow grease, Fibre Glast supplies the products for a first-class, final touch! Make the simplest choice a smart choice. Choose quality brushes and supplies that suit your composite project—and avoid headaches right from the start! Turn your composite into a high-performance part. Fiberglass rollers and squeegees are critical for saturating fabric, eliminating air and working out excess resin. Take the time to examine this category for the tools that are best suited for your project. 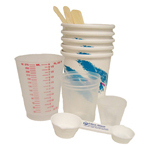 Mixing sets and starter kits come with all of the supplies for mixing, handling, and applying resin for your composite. 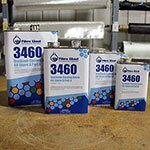 Quart, gallon, and 5-gallon sets are available and in stock for same day shipment. Why use Jiffy Mixers, or plastic stirrers for urethanes? Find out here, and access mixing supplies for your composite project, from cups to buckets, paper to plastic, graduated and solvent-proof containers, and more. Use modeling clays to create larger-scale prototypes and plugs, or to fill in details for smaller composite molds. Get Chavant Y2-Klay, AutoStyle, LeBeau Touche varieties. All are sulfur-free, non-toxic, shaped easily, and offer great temporary adhesive qualities. See our assortment of clays specially selected for composites work. 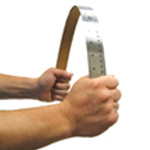 Measure accurately on both flat and curved surfaces—a workshop must. Rulers measure inches and metric, and come in various lengths. Steel and plastic varieties are available.